At summer you see people indulging in ice creams, popsicles, watermelons and corn on the cob, while some people have clear liquor beverages. Tonic water is one of those liquors, with its bitter flavor and effervescent quality, which goes perfectly well with gin in summer. Alcohol in excess can be bad for health, is tonic water bad for you? It depends on how much you consume, the ingredients, nutritional content and the type of tonic water. What Is Tonic Water and How Is It Made? Tonic water, also known as Indian tonic water, is a soft drink, carbonated in nature with an additive called as Quinine, which is commonly used in combination with other drinks, like gin. Quinine is actually a medicine, which was used as a prophylactic agent against malaria, whose content has been reduced in tonic. Since it has medicinal effects due to addition of quinine, it got the name "Tonic". Tonic water was intended to be used in South Asian and African regions, which has high cases of malaria. However, quinine by itself is very bitter, so the British officials, in the 19th century, from these regions, mixed it with soda water and sugar, giving rise to tonic—a prophylactic agent as well as an interestingly flavored drink. Currently, tonic still contains quinine; however, the quantity is much less. It is diluted and sweeter, and works well when mixed together with gin or vodka. To figure out the question: is tonic water bad for you, getting clear of the nutrition values in tonic water is essential. Given below is the nutritional content of tonic water. A glass of tonic water contains around 20 mg of quinine. For this quantity and occasional intake, it may not be bad for you; however, it could be in the some cases. Given below is when it could be bad and when it is safe to have it. When Is It Bad for You? Tonic water is bad for you when you are allergic to it. Some people might be allergic to quinine and can develop symptoms like hives, rashes, swelling in the mouth and tongue, which can lead to difficulty in breathing. It can also cause nausea, vomiting, diarrhea and cramps in the stomach. Some people have also reported adverse skin reactions and low platelet count on consumption of tonic water. Too much intake of tonic water is bad for you. Overtaking of tonic water can cause the person to become restless and hyperactive.Excessive intake of combination of alcohol and tonic can increase the severity of the side effects. It is not recommended to take tonic water with the purpose of resolving cramps, since very high quantity is required, which can be bad for you. Tonic water can interfere with other medications and cause side effects. Hence it is important to avoid taking it when you taking medicines like blood thinners. Pregnant and lactating ladies should also avoid tonic water, as it could be fatal for pregnant ladies. When Is It Safe for You? After solving the question: when is tonic water bad for you, you will naturally want to know: when can tonic water be taken safely? Tonic water is safe, when you have been drinking it for some time and do not find any associated health concerns. The quantity of quinine in tonic water is very low and hence has not been banned by FDA. It would be ideal to consult the doctor before trying quinine for the first time. Does It Lead to Weight Gain? One of the main ingredients of tonic water is sugar, and it is mainly in the form of high fructose corn syrup. 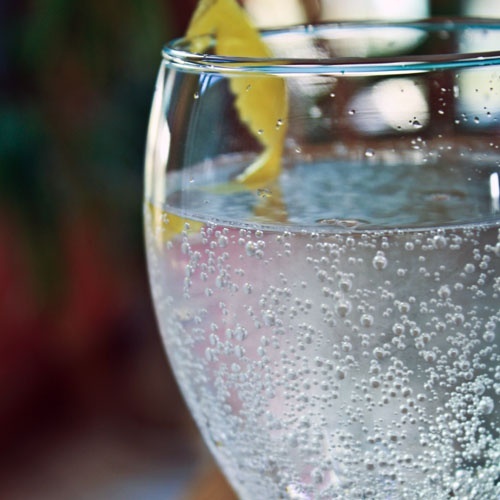 If you take tonic water consistently, it could lead to weight gain in the long run. This can result in you becoming prone to health conditions like high blood pressure, diabetes and cancer. Now that we have seen the answer to the question, is tonic water bad for you, we will proceed and see the different types of tonic water. A standard can of tonic water is of 12 ounces and contains 124 calories. Some people tend to drink tonic water as a beverage replacement for soda, cola and regular bottled water. The calories in tonic water are derived from added sugar or sweetening agent. The carbohydrate content of it is 32 grams. Some companies make tonic water without containing any calories, which is known as diet tonic water. They claim that 12 ounces of the tonic water contains 0 calories. The tonic water is sweetened using artificial sweeteners, which are nonnutritive in nature. Similar to diet tonic water, slimline tonic water is made from using artificial sweeteners, but with the same taste. Since it is without any calories, many people tend to drink it or mix it with other drinks. It helps those with weight loss targets, as it does not add to the daily calorie count and also reduces risk of type 2 diabetes. There have been very little or almost no side effects reported from the use of slimline tonic water.